I am one of hundreds of thousands eagerly awaiting the arrival of Machinarium, a game from Amanita, a Czech design team. My interest in the game stems from a preview in PCGamer magazine. The preview contained links to their already published Samorost 1 and Samorost 2 games. 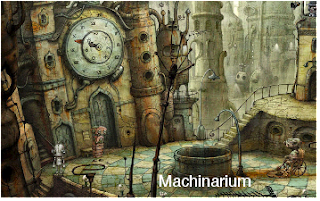 Go to http://www.machinarium.com where you can view a video preview of Machinarium and also link to Samorost 1 & 2. 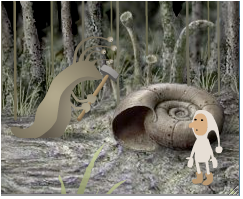 Samorost 1 is a free download and Chapter 1 of Samorost 2 is also free but Chapter 2 cost $5. It’s worth it. I paid my five bucks and downloaded both games. Amanita brings a European fairy-tale quality storyline, graphic style, and problem design to their games. 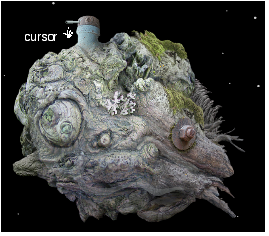 The main character in Samorost 1 lives on a small planet made of wood, rock, and moss, held together by a single nut and bolt. Wisps of smoke and flashing lights indicate that the interior is inhabited. The game is of the point-and-click genre. This means you move the cursor around until it changes to a “hand pointer” and then click to activate what’s under the cursor. Clicking on the metal turret in the upper left corner reveals that the turret is an observatory. A telescope appears, the main character (a little person in a hooded nightshirt) takes the stage, and the game begins. Other characters met along the way are mainly recognizable animals, like the snail pictured above, fantasy creatures, insects, and the occasional hookah-smoking human. Oh, and Samorost 2 is a story about the man and his dog. 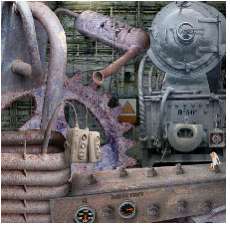 To solve each level of these games you have to pay close attention to small details in the graphic environment, be imaginative, understand that what’s possible in the character’s world that may not be possible in your world, listen for sound clues, be persistent, be patient as it may take time for events to unfold in the character’s world, and, most important of all, don’t try to rewrite the story by forcing your logic onto the character and the character’s world. The little man travels around in a sausage-can rocket ship. Cool. 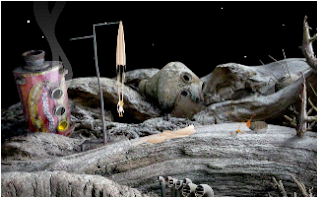 Here, in Samoraost 2, he’s parachuted onto another planet after his rocket ran out of fuel. Two of our grandkids, Joshua and Jordann, ages nine and eight, played through both games over a recent weekend visit. The computer was always on and they had permission to play when they wanted to. They played casually, sitting down for ten minutes or so and then, like kids do, going off to do another activity (like acting-out Bible stories with grandmother). They wanted to solve each puzzle by themselves but, if they ran out of ideas, they asked for help. I would ask a leading question or give a hint to help them on their way. I was impressed with the percentage of the puzzles they were able to solve on their own. I look forward to having fun exploring the magical world of Machinarium with the kids in the near future.